Flat, carved, wooden male figure (bioma or agiba) with two sets of arms and legs, painted red, white, and black. The knee and elbow joints are connected by bridges. The figure is in fair condition. The top of the upper half of the right arm is broken off and missing; at the center of the object, the edge of the right hand is broken off and missing; on the lower part of the torso are water stains; in the wood, passing from the left foot at the base, up the leg, is a deep split; part of the right thigh of the lower body is broken off and missing; part of the leg on the right side of the lower body was broken off and repaired. 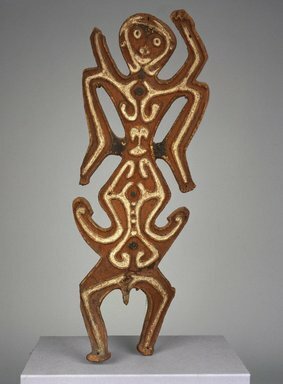 From accession card: Stylized, flat wooden male figure with four sets of limbs, two upraised, two lowered. It is painted black, sides connected with bridges at the knee and elbow joints. This figure has eight opposing limbs with raised designs imposed over them and the torso. It was cut from a curved slab (probably part of an old canoe- see refs/Newton). These small figures called 'bioma' are placed with legs in the eye sockets of wild pig skulls, which are regarded as almost as important trophies as human heads. They are kept in men's houses. Condition: Upper half of top right arm broken off and missing; edge of hands of middle right arm broken off and missing; water stains on lower part of torso; deep split in wood from foot up into leg on left- leg separating into two pieces; part of right thigh broken off and missing; upper leg on right side was previously broken off and repaired.